Halloween is getting nearer! The leaves haven't started turning, but I know Autumn is coming, eventually! I've spotted a few bats flying around at dusk (squee!) and it's finally starting to cool off a bit. So I've been getting in the spirit of things with fall colors and spooky fun, and of course, Gotta Love Brains. 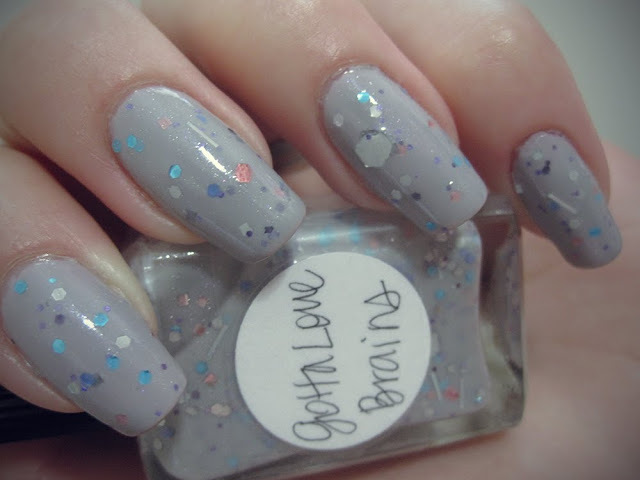 Such pretty grey matter! 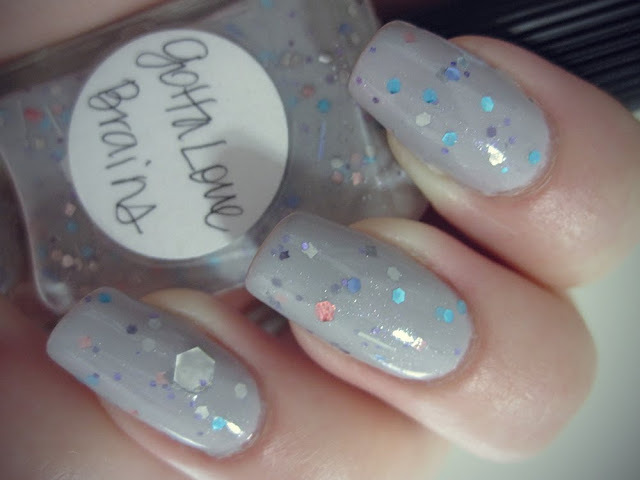 Lynderella's Gotta Love Brains is a grey-based semi-sheer polish with medium ocean blue, perwinkle, and white hexes, salmon squares and larger hexes, big white hexes, holographic bars, small lavender hexes, AND silver microglitter for some extra shimmer. There's a lot going on, and I just love it. 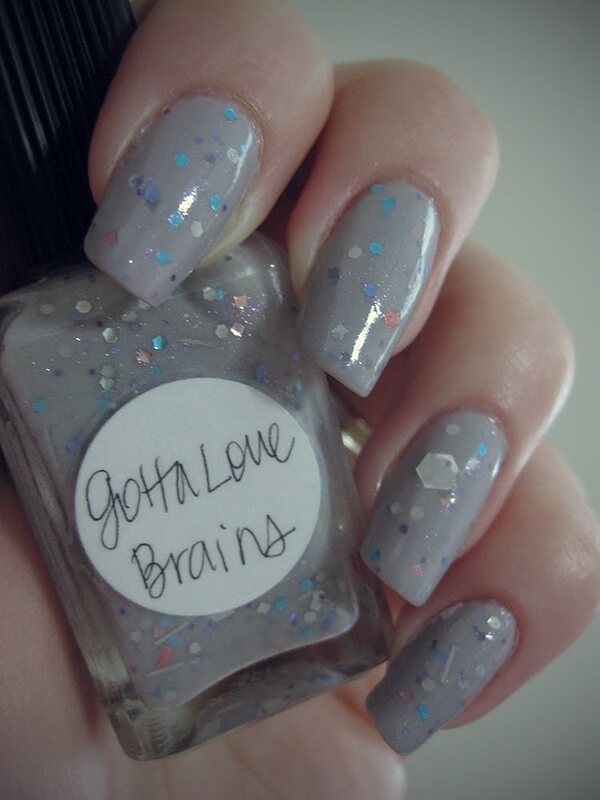 Not only is it a polish inspired by zombies munching on brains, but the unusual color combo is really beautiful. I know some people love a really packed glitter you can wear on its own, but I prefer it a little more sparse so I can layer it over another color. 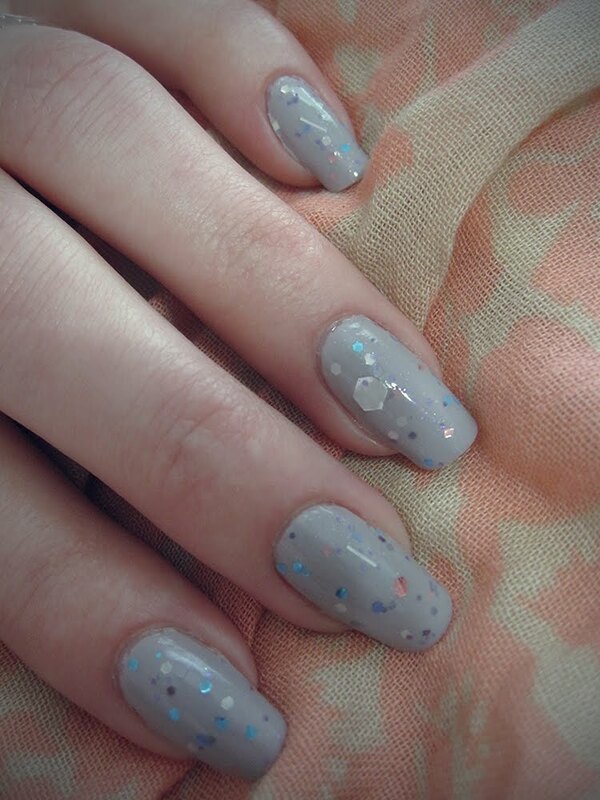 GLB was very easy to work with; glitter placement wasn't at all difficult, and I was able to get the coverage I like in just two coats (over two coats of Zoya Kendal, a very greyed out pale lavender, & one of my favorite underwears!). And it kind of complements my new skirt? Maybe? Unfortunately there has been a lot craziness and drama with Lynnderella and her polishes, and they've become insanely expensive and difficult to acquire, in addition to the fact that many simply no longer wish to support her brand because of said craziness. I only have a few of them myself, which I enjoy, but with all of the talented indie polish makers emerging I can't imagine there will be any want for beautiful glitter polishes! What a beautiful color! I wish I had this polish it's just lovely! I know what you mean about Halloween though, it's already on my mind! !